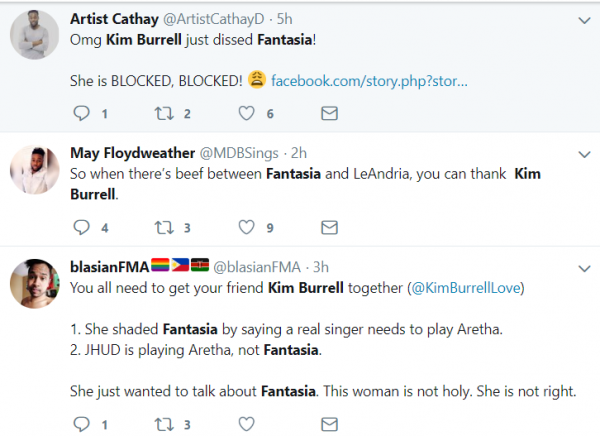 After seeing her 2017 and 2018 riddled with criticism for her anti-LGBT comments and more (click here to read more on that), ‘Try Me Again’ Gospel songstress Kim Burrell is under fire again – this time from Twitter followers who disapprove of disparaging remarks made toward R&B singer Fantasia. Burrell has made no secret of her admiration of her mentee, Grammy-winning songstress Leandria Johnson. And, despite earning a wealth of negative press for public drunkenness, profanity fueled rants on social media, and more (like those seen here), the 36-year-old continues to earn high praise from Kim – who maintains Johnson does not get her due reverence from the public. Case in point? 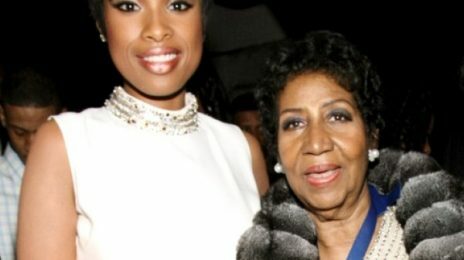 A recent event (seen in the video above) saw Burrell call out industry “powers-that-be” for not choosing Leandria to portray Aretha Franklin in the forthcoming biopic starring Jennifer Hudson (click here to read more on that). Incorrectly naming Fantasia as the film’s star, the ‘Sweeter’ singer’s speech above made fans sour when she suggested that Fannie was not as talented as Johnson. I thought she was already cancelled last year for hating on her gay base. Kim who? Fantasia ain’t hurting anybody so why come for her? What kind of Christian does that? Lol at the “she’s not, she’s not” in the background ahahhaaha. Fantasia ain’t got nothing to prove we all know what happens when she blesses a stage. 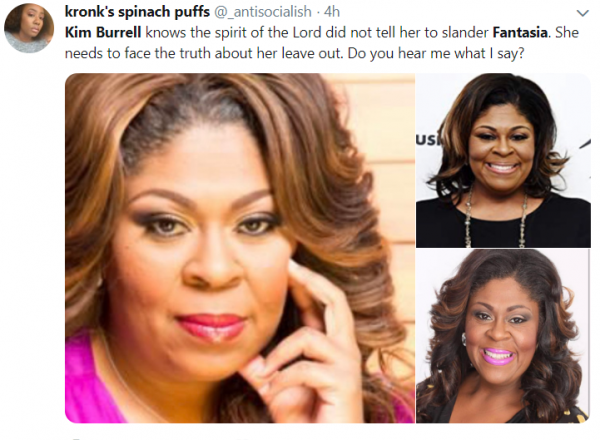 Kim Burrell is a miserable, fat, unattractive, mean-spirited church hag who hides behind the guise of JESUS. So-called saints like her are the reasons most avoid churches. All churches and religions are NOT the same. You are pretending like Kim’s religion is the only religion or your mind is not able to fathom the diversity that exists in religions and churches. Girl bye, where did I say any of that? I specified that “saints” like HER are the reason most avoid churches. A hit dog will holler. I guess English grammar is NOT your strong suit but making idiot GENERALIZATIONS is. Do you know what the word generalization is and why it makes whatever you are trying to say have a different meaning? Reading comprehension clearly isn’t YOUR strong suit. God also said not to be greedy! lookat all the food you eatting dumm! They can, and black twitter is expression their opinion and disagreement. I guess it works both ways. 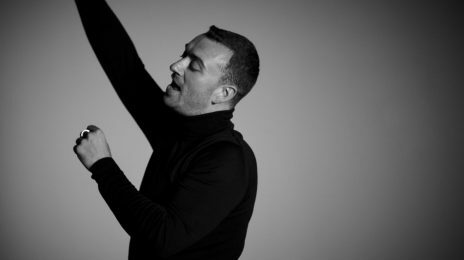 As a “minister” or “gospel singer,” why stand on a PULPIT and make such a nasty statement? What does some irrelevant gospel artist being better than Fantasia have to with the Word of God? Is this what they do in Church now? I’m so far removed, maybe I need to be educated…. When you express your opinion on social media or on a stage others will respond to you the same way (ie publicly)! She is not just expressing an opinion. She is preaching her opinion to an audience publicly. From her hair hat to her shoes she is obviouslly caught up in materialistic things instead of God’s message. The bible does NOT say preachers should go on stage hating on black women and that is what Kim did. Kim is right in some senses. Fantasia doesn’t need to play a legend as she is respected by legends and has been called to tribute them on many occasions, gaining standing ovations and also forcing a certain Miss Patty to be so overwhelmed that she gave us one of the best memes of the decade. Fantasia is known to evoke the holy ghost when she graces the stage and bring many and man, woman and demon begging for forgiveness and realising that Church on any day of the week is a must, whilst Kim is using her Christian values for negativity. 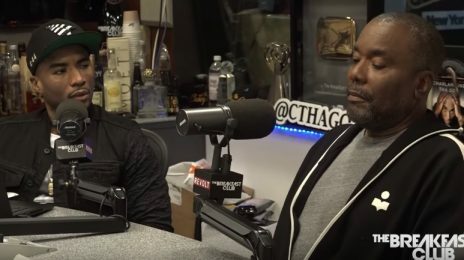 Kim you are entitled to your opinion, but your bad spirit had to bring it to the masses in what seemed to be a church setting with what seemed to be no context but to cause drama… get some girlfriends to call… and by the way… no one called you to tribute anyone. Isn’t this the same wench who said gays are perverted? Honey we don’t know you. Yolanda Adams would never. 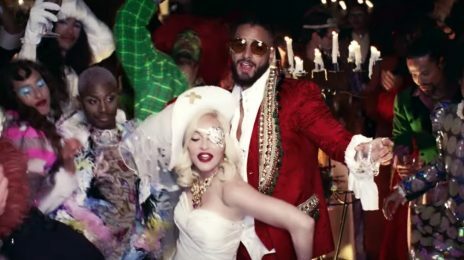 She was cancelled last year and not deserving of press. I guess the same people who ‘cancelled’ her still are checking for her. I long forgot about her. There are so many gospel singers with similar sounding voices to Kim’s that I honestly don’t see a reason why she still has a platform. Cut her Mic off PLEASE!! For a christian, as Ms.Burrell, says she is…it was absolutely wrong for her to spread a message such as that, from the pulpit. Especially, since JHud is playing the Queen of Soul. She should get her facts straight! She is so so messy and mean spirited. When people are a “has been”, they say things to remain relevant. When people who are “miserable” they fish for attention. Its obvious, her spirit has been miserable for a while and she’s intentionally seeking attention. It’s ok to have an opinion, you dont have to attempt to tear another down to say it. SHOCKING! 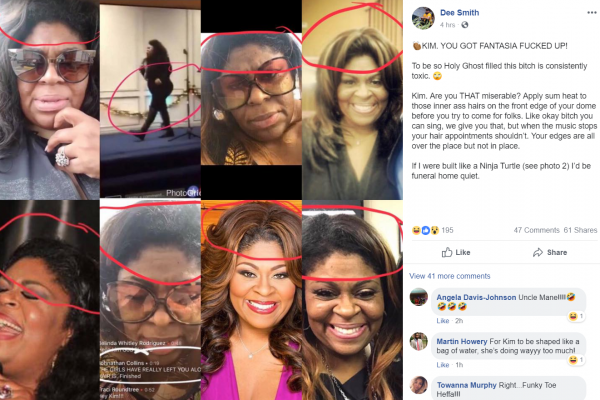 *NOT* Kim Burrell is still bitter and miserable after being blackballed. She wanted mainstream notoriety so bad, and it never happened. Not even Whitney could make her pop off. As a result, she goes around to churches being nasty and throwing shade in the name of Jesus. There was nothing truthful about her statement which was merely an OPINION that she could have kept to herself, or said in private convo. She is right though…. Fantasia is NO LeAndria. 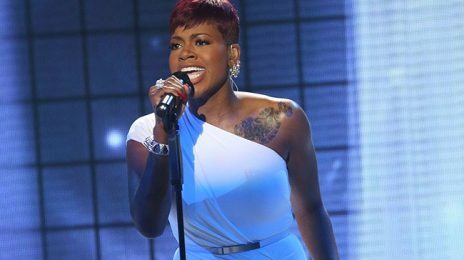 While both are immensely talented, Fantasia carries herself with class and decorum. LeAndria could learn a thing or two from Mrs. Barrino-Taylor. 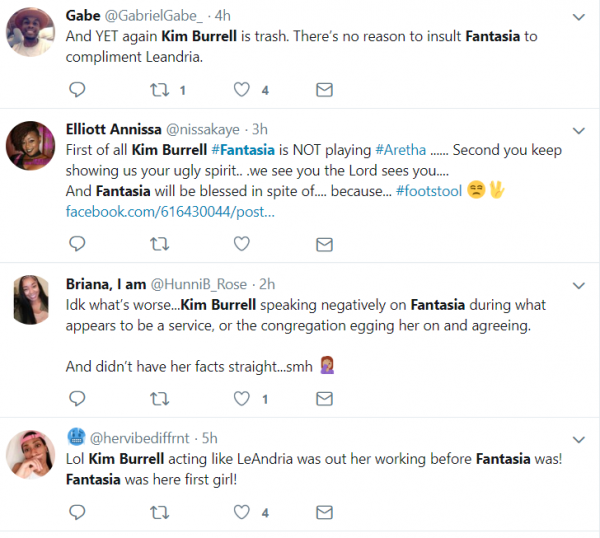 In my opinion, Fantasia carries herself like a true Christian unlike Kim Bullshitrell. I agree. She could have complimented Johnson and kept it moving. Meanwhile Tashia selling out venues all across the country. Tashia’s heart is so big, she would take Johnson under her wing and love on her. All Kim can do is belittle. Kim being black, got two other black folk confused. Jennifer and Tashia are two different talents. Although LeAndria can sing, these two are out of her league. Kim’s comment was vile, and it spoke to the kind of Christian she is. She is serving trumps God. Shame on you. yes They all hold they own. 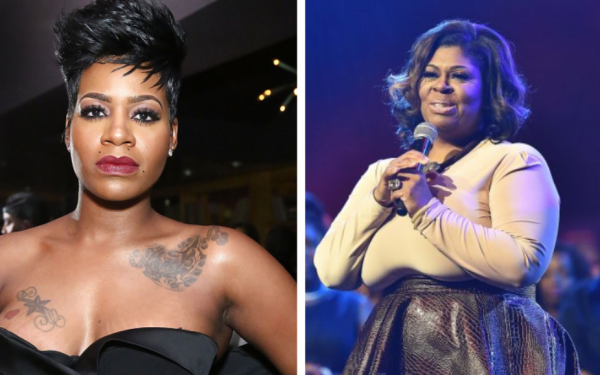 Don’t ever come for Fantasia !! In life Aretha Franklin enjoyed electrifying success and now, after her passing, the stage has been set for a dynamic send-off.